Betty and I and our guest writers have been maintaining this blog site for six and one-half years. From time to time we venture back and read what showed up on the site in the past. Here is a blog I wrote in March of 2011 as we were weorking on the intial edits for the film. 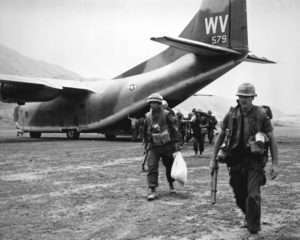 Photo of a Marine Corps C-123. 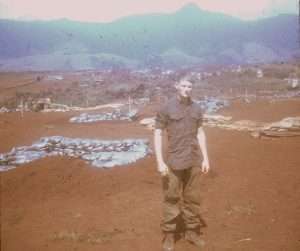 Ron Ryan shortly before the Siege of Khe Sanh began. Photo courtesy of Michael E. O’Hara. 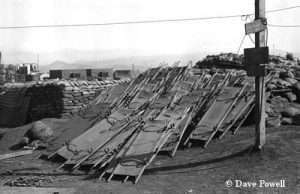 At the time, when the word came down the trench, the faces of the survivors in Second Platoon wore expressions of fear, shock and surprise. 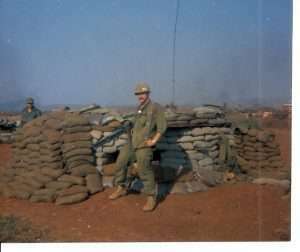 I knew Corporal Ron Ryan fairly well, as well as that curious battlefield intimacy we enjoyed at Khe Sanh allowed. 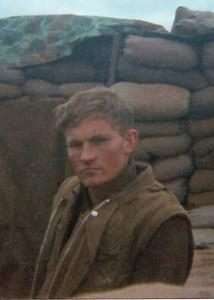 He was a machine gunner who’d been with Bravo Company, I think, since early October, 1967. At the time, it all reeled by in my mind like movie cartoons. My breath shrunk in my chest, grew shallow. Red mustache, dirty dungarees, big smile, Ryan kicking asses when catching Marines asleep on watch. Our shared miseries like no water for showers, not enough chow, constantly cleaning rusty rifles, incoming attacks, more incoming attacks, how we surfaced after they let up and laughed and laughed and laughed. We would see him no more. My head spun. We both laughed, surreptitiously, of course. There was a lot of gloom from the other Marines standing there, pondering life and its aftermath.